Why do I have to login with my NetrunnerDB user? What is the difference between "private" and "public" decks/decklists? I cannot see my decks when I am claiming my spot at a tournament. Do you plan to integrate with other deckbuilders? How do I import the tournament results? I have more questions or ideas. Because you will be able to link the decks created at NetrunnerDB with the tournaments you participated at. Also I can identify you as a user with your NetrunnerDB account. You won't need a separate registration for this site. This is done via the OAuth protocol. You have seen sites with the "login with Facebook / Gmail" option, this is the same thing. You are being logged in on NetrunnerDB and then redirected back. 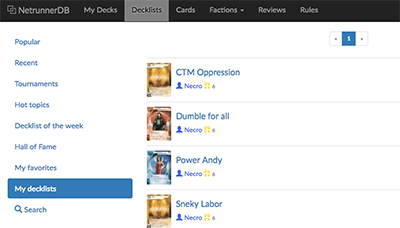 When you create a deck in NetrunnerDB, it is added to your list of private decks. In order to create a published copy of your private deck, click the Publish button. The deck is added to your published decklists. You can claim with your private decks, but AlwaysBeRunning.net will publish these decks and will reference the published version. By default I can only access your published decks. If you want to use your private decks here, please enable the Share your decks option in your NetrunnerDB account settings. After this is done, relogin into Always be Running.net, so changes can take effect. This is not planned. Though the possibility is there if the deckbuilder site has the needed API endpoints and has a wide userbase. You can do it in bulk either by NRTM or a CSV file that you prepare. Or you can import manually. NRTM is a Netrunner tournament manager app for iOS. First, download the identity names in the NRTM app by going to Settings >> Edit Names >> Download from NetrunnerDB.com. Assign those identity names to all of your players. Manage your tournament in NRTM. Once the tournament finishes, keep the results in the NRTM app. 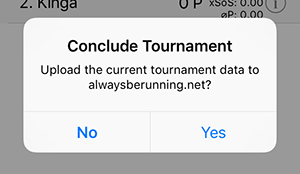 Open the AlwaysBeRunning.net page of the tournament in your Safari browser. Click the "NRTM results" button. The NRTM app will open and it will prompt to upload results. Tap "Yes". Go back to the AlwaysBeRunning.net page, refresh. Your results should be there. After the tournament is finished, go to tab More... >> Export. Click upload icon (cloud) on top. Select Upload to alwaysberunning.net. After NRTM uploads the results, you will receive a conclusion code. When you are concluding the tournament on AlwaysBeRunning.net, provide this code. Upload the NRTM.json results file: JSON export can be enabled by Settings >> Data Export >> switch on Add JSON Data to Export. You can also import results manually, adding each player one-by-one. Go to your concluded tournament and click Import manually. You can now add the player names and IDs to the results. You cannot link users or decklists. Your players have to claim themselves to get those in. If you made a mistake you can delete entries with the red trashcan icon next to them.